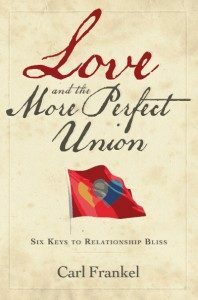 Love and the More Perfect Union combines proven strategies for achieving relationship harmony with the “continuum of connection,” an innovative model of emotions that provides invaluable insights into how we love and the energetics of intimate relationships. It distills the complex world of relationships to its essentials, surfaces secret challenges and opportunities, and serves up six simple and actionable precepts for harmony and happiness. With its call for creative culture-creation and positive thinking, it is fluff free, straightforward, wise, elegantly written and immensely useful. Find out why one recent reader called it “a great resource for anyone interested in creating more paradise within their relationship.